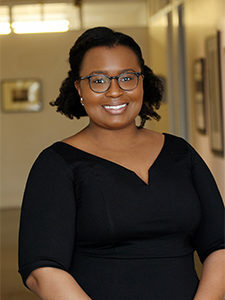 Seyferth Blumenthal & Harris LLP (SBH) is pleased to announce Linda Adeniji has joined the firm as an associate attorney. Linda’s practice focuses on civil litigation related to general employment law. She also provides labor and employment counseling to clients in addition to work in insurance coverage consulting, litigation and disputes. Prior to her legal career, Linda worked as a claims professional for one of the largest property-casualty insurers in the country. Linda received her undergraduate degree from the University of Texas and later earned her Juris Doctor from the University of Missouri at Kansas City School of Law. Prior to joining Seyferth Blumenthal & Harris, Linda worked a local Kansas City area law firm with a practice primarily focused on handling insurance-related matters, including bad faith litigation, first- and third-party defense, and insurance coverage disputes. Active in serving the local Kansas City community, Linda remains involved with the Association for Woman Lawyers of Greater Kansas City, Central Exchange, and Jackson County Bar Association.